EDM is the use of immersion in the working fluid in the pulse between the two electrodes generated by the electrochemical erosion of the conductive material of the special processing methods, also known as discharge processing or electro-erosion processing. In 1943, the Soviet scholar Lazareni couples studied the invention of EDM, and then with the pulse power and control system improvements, and the rapid development. The initial use of the pulsed power supply is a simple resistor-capacitor loop. 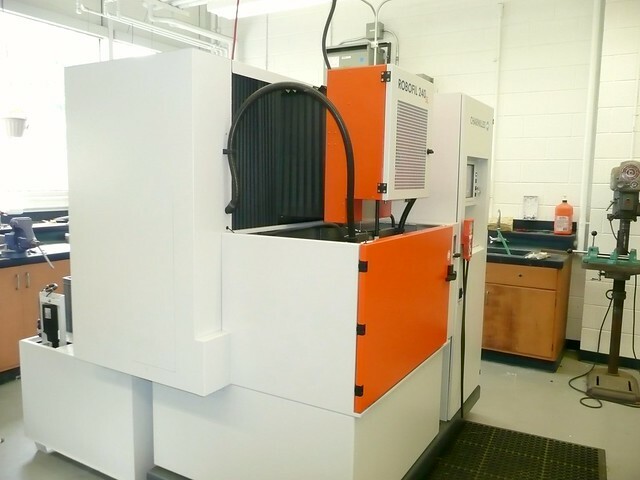 When the EDM is machined, the tool electrode and the workpiece are connected to the poles of the power supply, respectively, and immersed in the working fluid, or the working fluid is charged into the discharge gap. Through the gap automatic control system control tool electrode feed to the workpiece, when the gap between the two electrodes to a certain distance, the impulse voltage applied to the two electrodes will work fluid breakdown, resulting in spark discharge. In the discharge of the fine channel instantaneous concentration of a large number of thermal energy, the temperature can be as high as 10,000 degrees Celsius above the pressure there is a sharp change, so that the surface of the local trace of metal materials immediately melt, gasification, and explosive splashing to the working fluid , The rapid condensation, the formation of solid metal particles, was taken away by the working fluid. At this time in the workpiece surface will leave a small pit traces, discharge short stop, the working fluid between the two electrodes to restore the insulation state. Then, the next pulse voltage is in the two electrodes are relatively close to another point of breakdown, resulting in spark discharge, repeat the process. In this way, although each pulse discharge erosion of the amount of metal is very small, but there are thousands of times per second pulse discharge, you can erase more metal, with a certain productivity. The tool electrode is continuously fed to the workpiece while the workpiece metal is removed while maintaining the constant discharge gap between the tool electrode and the workpiece, and finally the shape corresponding to the shape of the tool electrode is processed. Therefore, as long as the change in the shape of the tool electrode and tool electrode and the relative movement between the workpiece, you can process a variety of complex profiles. Tool electrodes commonly used good conductivity, high melting point, easy processing of corrosion-resistant materials, such as copper, graphite, copper tungsten alloy and molybdenum. In the processing process, the tool electrode also has losses, but less than the amount of metal erosion, even close to no loss. Working fluid as a discharge medium, in the processing process also plays a cooling, chip and other effects. Commonly used working fluid is a low viscosity, high flash point, stable performance of the media, such as kerosene, deionized water and emulsion. Improved for resistance – inductance – capacitance and other circuits. At the same time, the use of pulse generators and the like so-called long pulse power, so that the erosion efficiency, tool electrode relative loss reduced. Followed by the emergence of high-power tube, thyristor and other high-frequency pulse power, so that the same surface roughness conditions to improve productivity. The emergence of transistors and SCR pulse power, improve energy efficiency and reduce the tool electrode losses, and expand the adjustable range of rough finishing. There have been high and low voltage composite pulse, multi-loop pulse, constant amplitude pulse and adjustable pulse pulse and other power supply, in the processing of surface roughness, machining accuracy and reduce the tool electrode losses and other aspects of the new progress. In the control system, from the initial simple to maintain the discharge gap, control tool electrode advance and retreat, and gradually developed to the use of micro-computer, the electrical parameters and non-electrical parameters and other factors for timely control. The main purpose of EDM is: ① processing with complex shape of the hole and cavity mold and parts; ② processing all kinds of hard and brittle materials such as hard alloy and hardened steel; ③ processing deep hole, Deep groove, slit and cutting sheet, etc . ; ④ processing all kinds of forming tools, models and thread ring and other tools and measuring tools. According to the form of the tool electrode and the relative movement between the workpiece and the characteristics of the workpiece can be divided into five types of EDM: the use of forming tool electrodes, relative to the workpiece for simple feed movement of the EDM; the use of axial Wire for the tool electrode, the workpiece in accordance with the required shape and size for the track movement to cut the conductive material of the EDM wire cutting; the use of wire or forming conductive grinding wheel as tool electrodes, for small hole grinding or forming grinding of electricity Spark grinding; for processing thread ring gauge, thread plug gauge, gear and other EDM conjugate rotary processing; small hole processing, engraving, surface alloying, surface strengthening and other types of processing. Mold in the EDM machine will generally use coarse, medium and fine processing of the file. Roughing is achieved with high power and low loss, while the middle and finishing electrodes have a large relative loss, but in general, the finishing allowance is small and therefore the electrode losses are minimal and can be compensated by machining dimensional control, or Do not affect the accuracy requirements to be ignored. EDM machine in the production of carbon residue and the exclusion of carbon residue balance conditions can be carried out smoothly. In practice, often at the expense of processing speed to remove carbon slag, for example, in the middle of the use of high voltage, large stop pulse and so on. Another reason for the exclusion of carbon residue is the complexity of the machined surface, so that the chip path is not smooth. Only to actively create a good exclusion of the conditions, symptomatic to take some way to actively deal with. EDM discharge pulse a long time, is conducive to reducing electrode wear. EDM rough processing generally use long discharge pulse and high current discharge, processing speed fast electrode loss is small. In the finishing, the small current discharge must reduce the discharge pulse time, so not only increased the electrode loss, but also significantly reduce the processing speed. EDM is a new process that is completely different from machining. With the development of industrial production and the progress of science and technology, with high melting point, high hardness, high strength, high brittleness, high viscosity and high purity and other properties of new materials continue to emerge. With a variety of complex structures and special requirements of the workpiece more and more, which makes the traditional mechanical processing methods can not be processed or difficult to process. Therefore, in addition to further development and improvement of mechanical processing, but also efforts to find new processing methods. EDM can meet the needs of production development, and in the application shows a lot of excellent performance, therefore, has been rapid development and increasingly widely used. EDM is mainly used for mold production in the hole, cavity processing, mold manufacturing has become the leading processing methods to promote the mold industry, technological progress. The number of EDM parts in the following 3000, the stamping parts than the mold in the economy more reasonable. According to the process of tool and workpiece relative movement of the characteristics and uses of different, EDM can be broadly divided into: EDM processing, EDM wire cutting, EDM grinding, EDM into processing, non-metallic EDM Processing and EDM surface strengthening. The method is through the tool electrode relative to the workpiece for the feed movement, the workpiece electrode shape and size copied on the workpiece, which processed the required parts. It includes two kinds of EDM cavity processing and perforation processing. EDM cavity processing is mainly used for processing all kinds of hot forging die, die casting mold, extrusion die, plastic mold and bakelite cavity. EDM perforation is mainly used for the processing of holes (round hole, square hole, polygonal hole, shaped hole), curve hole (bending hole, screw hole), small hole and micropores. In recent years, in order to solve the small hole in the processing of small electrode section, easy to deformation, hole diameter ratio, chip and other problems, in the EDM perforation processing in the development of high-speed small hole processing, and achieved good social and economic benefits. The method uses a moving fine wire as a tool electrode, and performs pulse discharge cutting according to a predetermined trajectory. According to the size of the wire electrode moving speed is divided into high-speed wire and low-speed wire cutting. EDM has the following characteristics: can be processed any high strength, high hardness, high toughness, high brittleness and high purity conductive material; processing without significant mechanical force, suitable for low stiffness workpiece and microstructure processing: pulse parameters can be based on Need to adjust, can be in the same machine for roughing, semi-finishing and finishing; EDM surface after the presentation of the pit, is conducive to oil storage and reduce noise; production efficiency is lower than the cutting process; part of the discharge process Energy consumption in the tool electrode, resulting in electrode wear, affecting the forming accuracy. EDM can be used to process ordinary cutting methods difficult to cut the material and complex shape of the workpiece; no cutting force when processing; no burrs and knife marks and other defects; tool electrode material is not harder than the workpiece material; direct use of energy processing, To achieve automation; after processing the surface of the metamorphic layer, in some applications to be further removed; working fluid purification and processing of smoke pollution caused by more trouble. EDM is mainly used for processing molds and parts with holes and cavities of complex shapes; processing of various hard and brittle materials such as hard alloy and hardened steel; processing deep hole, shaped hole, deep groove, Slits and cutting sheets, etc . ; processing of various forming tools, molds and thread gauges and other tools and measuring tools.